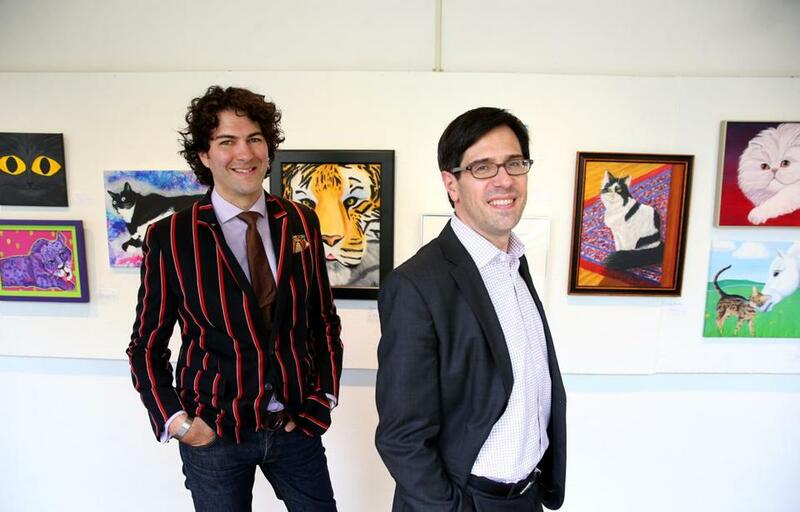 WORCESTER — “I’m a dog person,” a visitor told Adam Rozan, as he stood amid 230 artworks showing cats at the Worcester Art Museum. Big cats. Tiny kittens. A cat wearing Andy Warhol glasses printed against a background of Campbell’s Soup cans. A cat-shaped tea cozy and a cat-printed quilt. A collage of cats in hats. A Magic Marker stick-figure cat. Rozan is director of audience engagement at the museum, where “Meow: A Cat-Inspired Exhibition” runs through Sept. 4. This was in the “Community Cats” segment of the exhibition, which features work submitted by local artists (including one attributed to a 5-year-old). The exhibit, both Rozan and museum director Matthias Waschek said, is part of a push to reengage the community with the museum. The Worcester Art Museum is adapting. Waschek became director in 2011, and new leadership has reimagined how the museum could serve a changing demographic and enliven the museum’s role in the community. Hence the cats. “Meow” is the largest project in the museum’s history. It is a nine-part exhibition — “which I like, because of the nine lives,” Rozan said — including community events, Cat Craft Classes (alliteration and puns are used liberally throughout “Meow”), a self-guided tour called the Cat Walk, which leads viewers to 17 cat-related works on four floors, a Cats-in-Residence program, and an exhibit titled “The Captivating Cat: Felines and the Artist’s Gaze,” featuring works from the museum collection. General admission visitation since “Meow” opened last month has been up 48 percent over the same period last year. About a thousand people attended the opening party. As an engagement technique, a large-scale cat-themed exhibit has promise. An Internet truth: People like to look at cats, or at least pictures of cats. Felines are constant fodder for YouTube videos (a search for “cats” yields 35.4 million results) and regular characters in memes. There are even Web-celeb cats, like Grumpy Cat and Lil’ Bub. Cats are America’s number one pet; according to a 2015-16 APPA National Pet Owners Survey, Americans own a total of 85.8 million cats, compared with 77.8 million dogs. Adam Rozan (left), director of audience engagement at Worcester Art Museum, and Jon Seydl, director of curatorial affairs. Initially, Rozan said, he had wanted to do an exhibit about dogs, but as he searched for dogs in the museum’s collection, he started noticing all the cats. A team got together, including Jon Seydl, director of curatorial affairs, and Ruthie Dibble, a PhD candidate at Yale. They began a large-scale search for cats. “It was so wonderful to just dig and dig with one theme in mind,” Dibble said. A cat lover, Dibble said she loves dogs equally (a rare breed of person). For the record, dogs haven’t been entirely excluded from the exhibition. The museum mascot is an armor-wearing dog named Helmutt. Both the “Captivating Cat” show and the Cat Walk yield a surprising variety of works. Seydl pointed out cats carved almost imperceptibly into a Persian set of mail and plate leg armor. A lion roars on a World War I enlistment poster. A cat’s eyes glow on a Harry Gordon paper dress from the 1960s. Bronze Egyptian statuettes lurk regally. 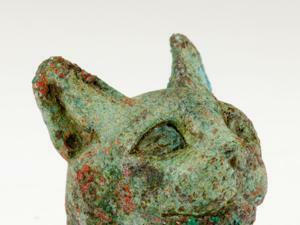 “Head of Cat,” from Egypt’s 11th Dynasty. On July 13, live cats are moving in. 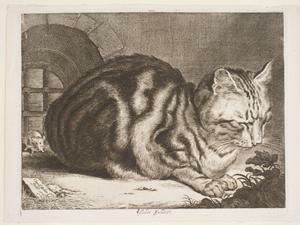 Artist-curator Rhonda Lieberman is bringing the Cats-in-Residence program to WAM, a project she calls a “purr-formance piece.” Rescue cats will live in a kind of “cat-aviary” and play in a cat-friendly art-installation (which humans can enter, watch through a window, or livestream online). “Art doesn’t have to be only for humans,” Lieberman said. “It can help us abide with other species.” All of the cats are up for adoption, brought to the museum by the Worcester Animal Rescue League. This will be the fourth Cats-in-Residence show, and 55 cats have found homes through the project in other cities. Paula Hogan, of Northborough, was visiting the museum with two friends. “Are we cat lovers?” she said. “Yes. Absolutely.” Hogan was inspired to come to the exhibit when a friend saw a picture of her cat, Pepper, on Facebook, and suggested that she submit a picture for “Community Cats.” She missed the deadline, but came to see the show. 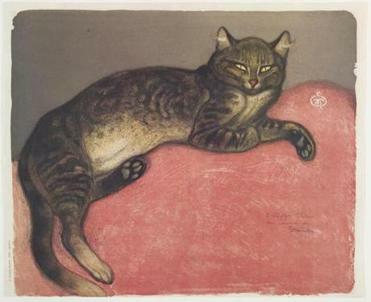 At “Meow,” visitors see pieces of their own lives on the museum walls. Hogan pulled out her iPhone to compare an image with Pepper. Nearby, two little girls with colored pencils and paper were copying a cat painting. The largest demographic at 1 p.m. on a recent Thursday was easily children — field trips and families created quite a din. “This is what a museum should sound like,” Rozan said.